Sony - QGDCL1 SONY - 8MM MAMMOTH AME 1 2 LT CLEANING TAPE (QGDCL1). NEW. IN STOCK. MINIMUM ORDER 6 PCS. SAME DAY SHIPPING. Exabyte - 313769 EXABYTE/TANDBERG - 8MM MAMMOTH AME 1 22 METER 2.5/5.0GB TAPE (313769). NEW. MINIMUM ORDER 10 PCS. IN STOCK. SHIP SAME DAY. 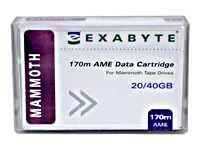 Exabyte - 312629 EXABYTE/TANDBERG - 8MM 20/40GB 170 METER AME MAMMOTH DATA CARTRIDGE (312629). NEW. MINIMUM ORDER 10 PCS. IN STOCK. SHIP SAME DAY. Sony - SDX4CLLWW SONY - AIT-4 AME CLEANING CARTRIDGE (SDX4CLLWW). NEW. MINIMUM ORDER 2 PCS. IN STOCK. SHIP SAME DAY. 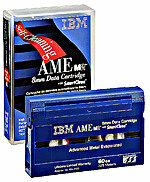 IBM - 59H2678 IBM - 8MM 170 METER 20/40GB MAMMOTH AME 1 TAPE CARTRIDGE (59H2678). NEW. IN STOCK. SHIP SAME DAY.